There’s already a somewhat surprising development early in the Pac-12 season. The top two backs aren’t named Love and Gaskin, but instead Jefferson and Pierce. And they’re from Oregon State. The Pac-12’s 2018 class of running backs is unquestionably led by Stanford’s Bryce Love, a Heisman finalist last year who returned for his senior year. Washington’s Myles Gaskin came back for another season, too. Utah’s Zack Moss is also considered a rusher to watch this fall. But a pair of Beavers — Jermar Jefferson and Artavis Pierce — lead the Pac-12 in average yards in the early going. That’s notable considering Oregon State’s opening opponent was Ohio State. Pierce, who ran for 168 yards and two touchdowns in the loss to the Buckeyes, injured his elbow in the Beavers’ 48-25 victory over Southern Utah last Saturday. A junior, Pierce was widely considered the heir apparent to Ryan Nall, who decided to skip his final season at Oregon State and go pro. 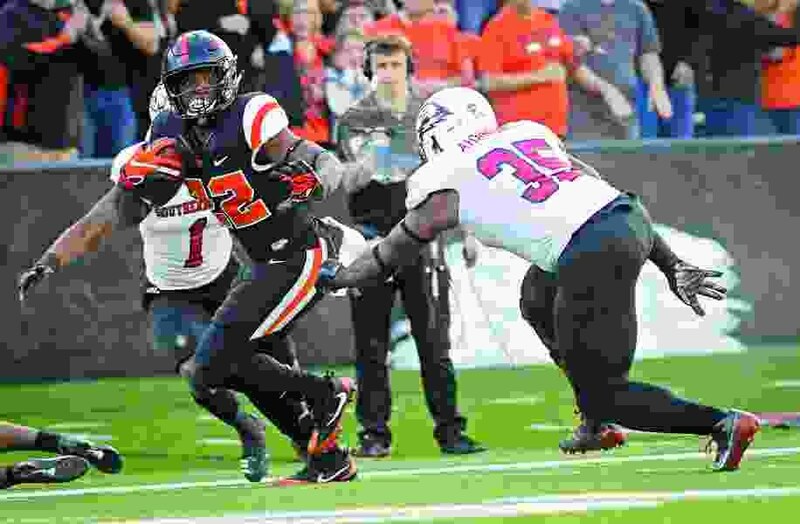 Jefferson is atop the depth chart for the Beavers’ game at Nevada on Saturday, but Oregon State coach Jonathan Smith said he’ll make sure other backs get in the mix, too. Jefferson currently leads the Pac-12 with an average of 142.5 yards through two games. Again, it’s early, but it’s an encouraging sign for the Beavers, who could use any success that comes their way. ALL YOU NEED IS LOVE: After being held to 29 yards rushing in Stanford’s opener against San Diego State, Love ran for 136 yards and a touchdown in last weekend’s 17-3 victory over USC . Known for his long runs, Love had a 59-yard dash that led to a field goal in the third quarter. He’s sitting out ninth-ranked Stanford’s game Saturday against UC Davis with an unspecified injury. “There’s no pressure to have a certain number of yards, or impress a certain number of voters. We can’t worry about that stuff. Because at the end of the year, hopefully we win as many games as we can win and if they want to hand some of our guys awards, that’s great, if they don’t, who cares? That’s not up to us,” Shaw said. IT KEEPS YOU RUNNIN’: A lot was expected from Moss after he rushed for 1,173 yards and 10 touchdowns for Utah last season. Moss ran for 150 yards and a touchdown in the Utes’ season-opening win over Weber State, but the running game faltered a bit last week in the 17-6 victory at Northern Illinois. Utah gained just 68 yards on the ground. Moss had 66 of those yards on 16 carries, with a touchdown. Coach Kyle Whittingham said it’s important to get the junior more involved. I CAN SEE FOR MYLES: Gaskin had 75 yards rushing in the Huskies’ opening loss to Auburn, putting him ahead of Napoleon Kaufman for the school’s career rushing record. But he was limited to 53 yards on 15 carries in last weekend’s win over North Dakota . Coach Chris Petersen said it just makes sense that a team’s rush takes longer to develop. “You practice the pass game all the time. You can throw all the time. But to practice really the running game and put pads on and have those five guys getting real reps, it takes a while to get into that rhythm,” he said. ALL TOGETHER NOW: No. 20 Oregon had to figure out who was going to replace Royce Freeman, the team’s prolific back who is now with the Denver Broncos. Turns out the answer was, well, a bunch of guys. The Ducks are getting yards from lots of players but a couple of newcomers stand out: CJ Verdell and Travis Dye. Verdell leads the team with 157 total yards through two games. “It’s been a good-type challenge to figure out who goes in there first, but we do feel confident that all these guys give the opportunity to win football games,” coach Mario Cristobal said.